GAA President John Horan says Croke Park will look into the controversial issue of Championship venues and scheduling – but says it's impossible to keep everyone happy. Both All-Irelands are being decided on new formats this year. Leinster and Munster hurling were run off as separate five-team round-robin groups with some counties being asked to play four games in successive weeks. 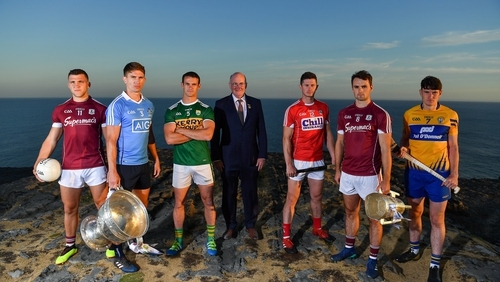 Football’s new-look quarter-final stage, the Super 8s, throws-in this weekend, with Dublin being granted two games at Croke Park in their own back yard. Both of these issues have caused the GAA headaches this year and Horan has promised to review them, but warns that not everyone will be happy. "You can't solve everything for everyone and you will get divergent opinions on things," he said. "So in that context, if we go for A or B, we'll never be seen to be totally right." Kildare’s Newbridge or Nowhere campaign lit a fire amongst many grassroots GAA fans. The Lilywhites were fixed to play their All-Ireland football qualifier with Mayo at Croke Park by the Central Competitions Control Committee (CCCC) despite having been drawn out of the hat first and therefore supposed to have home advantage. They dug their heels in and eventually played the game at St Conleth’s Park, winning on their way to the Super 8s. Donegal then raised an objection to Dublin getting two quarter-final fixtures at Croke Park, though they didn’t get any joy. Horan was coy on this subject, saying as a Dubliner that his contribution could easily be misinterpreted. "It all depends on which side you're coming from, and no matter what I say in that debate it's always going to be seen I'm going to say something with a bit of a shade of blue on my back," he said. "I don't think Donegal's real gripe is about Dublin necessarily playing in Croke Park, I think Donegal's probable frustration is the actual structure of the games that their first game is in Croke Park, I think that is part of their problem. "I think it's more the arrangement of the games, that their first game happens to be against a provincial champion. "Some people are making that point, that maybe the provincial champions shouldn't play off against each other in the first set of matches, that they should all get a home game in the first set of matches. "This is a debate that needs to be held. Look, I think Donegal felt they had to express a view on the matter." However, he did question why Dublin’s near-residence in Croke Park is only being questioned now. Since the advent of the Spring Series, which sees the Dubs play home League games in Croker, in 2011, nearly three quarters of all of their competitive games have been staged at the biggest stadium in the country. "When has this developed? I would ask who is driving that perception," he said. "Dublin have been playing in Croke Park for a long number of years now and all of a sudden one issue over the 'Super 8s' has kicked all of this off." RTÉ.ie is the website of Raidió Teilifís Éireann, Ireland's National Public Service Broadcaster.